With cameras and steel doors that slam shut in seconds, this is ‘arguably one of the safest schools in Utah.’ But will lawmakers fund more like it? (Trent Nelson | The Salt Lake Tribune) Utah Gov. Gary Herbert eats lunch with students during a visit to Rose Springs Elementary in Stansbury Park to discuss school safety with educators. (Trent Nelson | The Salt Lake Tribune) Utah Gov. 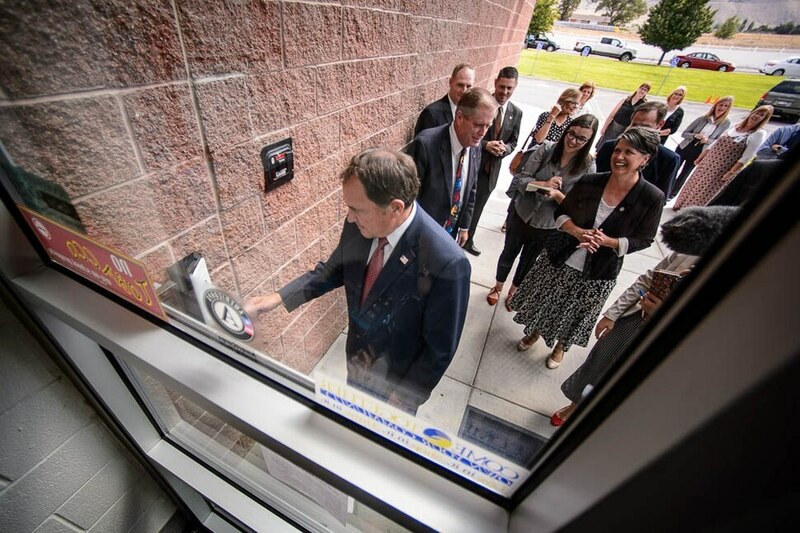 Gary Herbert encounters a locked door and intercom during a visit to Rose Springs Elementary in Stansbury Park to discuss school safety with educators. (Trent Nelson | The Salt Lake Tribune) Utah Gov. 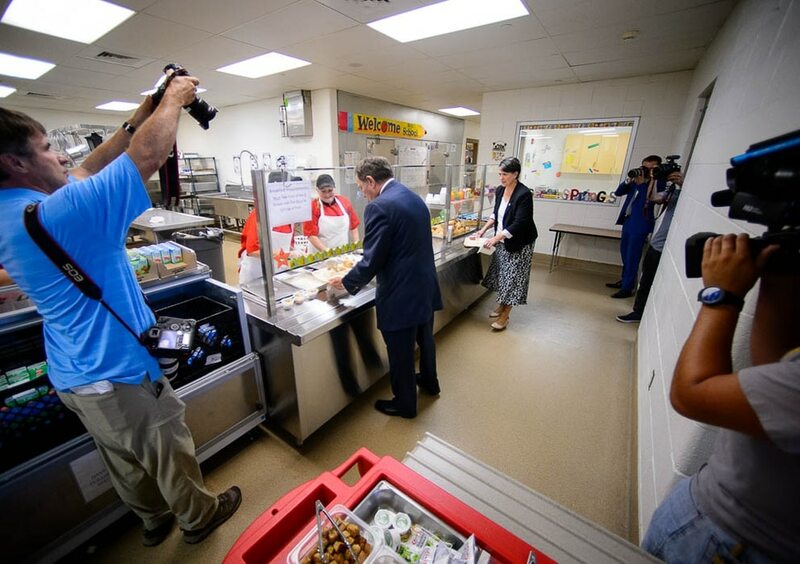 Gary Herbert picks up a school lunch surrounded by cameras during a visit to Rose Springs Elementary in Stansbury Park to discuss school safety with educators. (Trent Nelson | The Salt Lake Tribune) Utah Gov. Gary Herbert meets with school counselors during a visit to Rose Springs Elementary in Stansbury Park to discuss school safety with educators. (Trent Nelson | The Salt Lake Tribune) Tooele School District Superintendent Scott Rogers demonstrates the resilience of new security doors at Rose Springs Elementary in Stansbury Park. (Trent Nelson | The Salt Lake Tribune) Utah Gov. 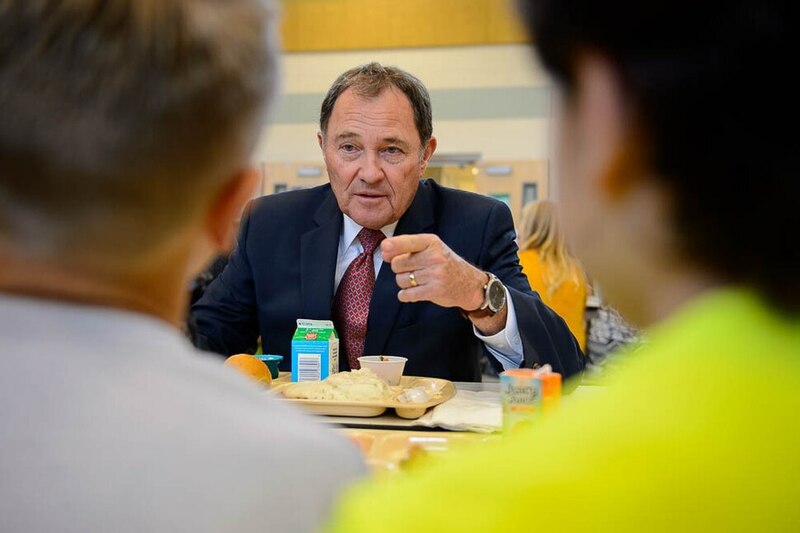 Gary Herbert speaks with students at lunch during a visit to Rose Springs Elementary in Stansbury Park to discuss school safety with educators. (Trent Nelson | The Salt Lake Tribune) Utah Gov. Gary Herbert picks up a school lunch during a visit to Rose Springs Elementary in Stansbury Park to discuss school safety with educators. (Trent Nelson | The Salt Lake Tribune) Utah Gov. Gary Herbert visits Rose Springs Elementary in Stansbury Park to discuss school safety with educators. (Trent Nelson | The Salt Lake Tribune) A demonstration of new security doors at Rose Springs Elementary in Stansbury Park. (Trent Nelson | The Salt Lake Tribune) Utah Gov. Gary Herbert visits Rose Springs Elementary in Stansbury Park to discuss school safety with educators. (Trent Nelson | The Salt Lake Tribune) Utah Gov. Gary Herbert is welcomed by students at lunch during a visit to Rose Springs Elementary in Stansbury Park to discuss school safety with educators. (Trent Nelson | The Salt Lake Tribune) Marianne Oborn, Social Services & Counseling Director for Tooele County School District. Utah Gov. Gary Herbert visits Rose Springs Elementary in Stansbury Park to discuss school safety with educators. Stansbury Park • As Utah Gov. Gary Herbert stood by the front office of Rose Springs Elementary School, the walls quickly closed around him. Solid steel curtains slammed shut. One blocked off the cafeteria. Two more stretched across hallways. The governor visited the rural Tooele County school Wednesday to try out the new security doors installed this month before classes started. A secretary activated the fortress-like feature by turning a key, and it took just five seconds to lock Herbert in the foyer. The system is meant to stop an active shooter. And it’s one model that Herbert is looking at as he weighs options for how to improve school safety in Utah — and allocate funding for it in his upcoming budget — following mass shootings in Florida and Texas earlier this year. The doors cost “hundreds of thousands” of dollars, though most of the work was done pro bono by four local companies, said Scott Rogers, superintendent of Tooele County School District. There are 15 around the school, and they can be used to blockade the entire perimeter. While they stood inside the closed-off lobby, Rogers ran into one of the bulletproof doors to demonstrate the strength. State Rep. Steve Eliason, who accompanied Herbert as they looked for innovative safety ideas, snickered a little when the superintendent bounced off the metal frame. Salt Lake City School District recently added a similar setup at some of its buildings. Herbert said he believes improving school safety, and avoiding mass shootings, should start with these kind of security features. But he envisions a broader fix including much more — particularly mental health initiatives. The governor, along with Reps. Eliason and Merrill Nelson, met with a group of 20 Tooele County school counselors to talk about how services could be bolstered for students across the state. “Our adult-to-student ratio is just getting a little out of control,” responded one counselor, who said her current caseload is too high to adequately address each kid’s situation. “We don’t have the time to meet the basic needs of the student who’s at our office,” added another. Most of the counselors said the district needs more funding so it can hire additional social workers and psychologists. Right now, Tooele County uses a federal grant that has allowed it to put a half-time counselor in each of its elementary schools, said Marianne Oborn, counseling and social services director for the district. But it’s not enough, she told the governor, and the one-time allocation will run out this year. Herbert said he would like to set aside funding for that in his budget — which state lawmakers would have to approve — but he also encouraged Oborn and others to vote “yes” on the Our Schools Now ballot question this November. It asks Utahns whether they support a future 10-cent gas-tax increase that would indirectly support schools, which could use the money to hire more counselors. Herbert also suggested that strengthening families and getting the private sector involved, like with Rose Springs' doors, could help schools with safety. His visit comes after the Utah School Safety Commission made a series of recommendations that could lead to legislation when lawmakers go back into session in January. Among those ideas were panic-alert systems for educators.